Coins come in three sizes: 2, 3, or 4, which are worth 2, 3, and 4 points. The pulldowns under "total numbers" control how many of each are available. Object: two players alternate dropping a coin of size 2, 3, or 4 without overlapping any coins already dropped. The player with the most points wins. 1. 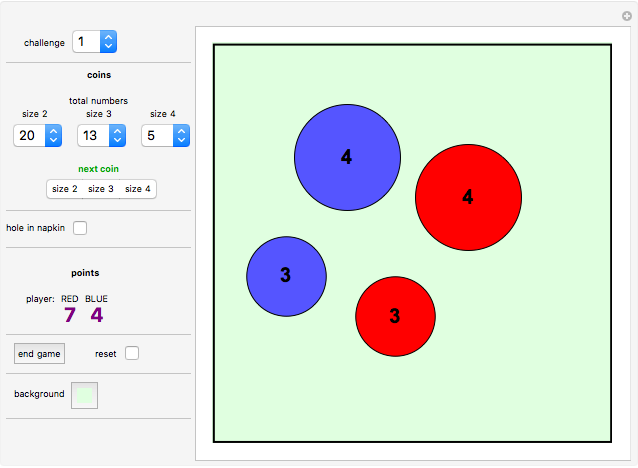 A player clicks "size 2," "size 3," or "size 4," which drops a coin at the lower-left corner. 2. The player drags the newly created coin from the lower-left corner to a good place. A coin is well placed when it does not overlap an edge of the board or a previously placed coin. Also, if "hole in napkin" is checked, a coin may not overlap the small black disk close to the center. The warning sign "overlap!" shows when the coin is not well placed. When the coin is well placed, the next player can move. The first coin of the first player should be of size 2 (this is not enforced by the program). When a player cannot move, they must click the "end game" button. The system updates the point list if necessary and indicates whether it is a draw or which player won. To balance the advantage of going first, the first player should start with the smallest coin (size 2). This is not enforced by this program, though. See also "hole in the napkin" for another balancing feature. "challenge": Select one of five suggested setups. You can still change the setup after your selection. "reset": Restore the starting position. "total number": For each of the sizes 2, 3, and 4, there is a drop-down menu that sets the number of coins available for that size. Once a coin is on the board, you cannot change the number of coins available. "hole in napkin": If you check this toggle before the first coin is dropped, a "hole in the napkin" (a small black circle) appears. Coins are not allowed to overlap with the hole. The first player has a strategy of playing in the middle and then playing symmetrically. The "hole in the napkin" forces an asymmetry that breaks that strategy. "points": Here the current points per player are displayed. 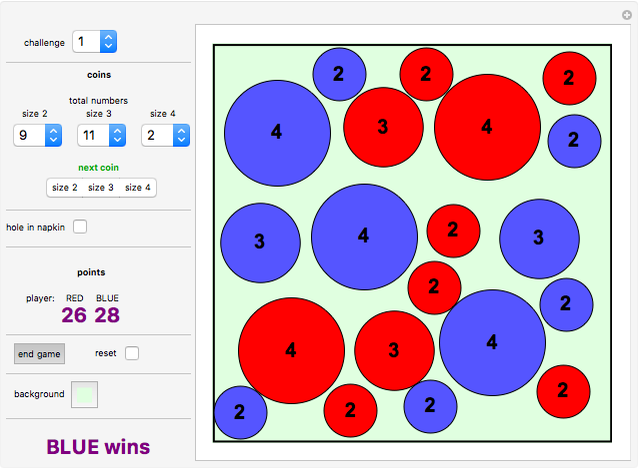 "end game": Click this button when the player whose turn it is cannot place a coin without overlap. Depending on which player has accumulated more points, the system declares a winner or a draw. "background": Controls the background color. In the original widely published version of "Napkin Chess," the last player who can place a coin wins. The player who starts by placing a coin in the center can always win (by playing symmetrically) if all sizes of coins are always available. With a limited supply, the game is not as trivial, but a bit boring since there is not much visible strategy. 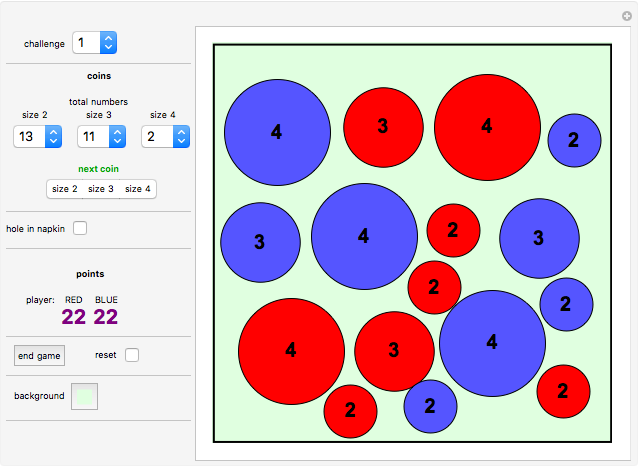 Therefore point values have been introduced for the coins in this version of "Napkin Chess." This is a natural adjustment in the rules, since coins in real life have an assigned value. The game now allows for more strategy.